You can’t save the world alone, so this year, join fellow fans and celebrate The World’s Greatest Super-Heroes for Justice League Day on November 18th. Find out more about Batman, Superman, Wonder Woman, The Flash, Aquaman and Cyborg at one of the many participating locations that will be featuring creator signings and so much more! DC and its publishing partners have created an action-packed Justice League activity kit for your enjoyment! The activity kit is filled with coloring pages, word searches, word mazes, cut out mask and more! Gather your friends and family and team-up to share this fun-filled activity kit in celebration of the Justice League. Grab your tights, capes, gear and gather your friends for a day full of Justice League adventures. Start the day by watching some of the league’s popular animated series like Justice League and Justice League Action, get out the game system and play Injustice 2 featuring the league members themselves and finish the evening by watching the brand new Justice League film starring Ben Affleck as Batman, Henry Cavill as Superman, Gal Gadot as Wonder Woman, Ezra Miller The Flash, Jason Momoa as Aquaman and Ray Fisher as Cyborg! Enjoy the rich history of the Justice League with the DC library with over forty-five years of Justice League content to explore. The World’s Greatest Super-Heroes are featured together in graphic novels like JUSTICE LEAGUE VOL. 1: ORIGIN, JUSTICE LEAGUE VOL. 1: THE EXTINCTION MACHINES, JUSTICE LEAGUE: THEIR GREATEST TRIUMPHS, and solo in books like SUPERMAN VOL. 1: SON OF SUPERMAN, BATMAN VOL. 1: THE COURT OF OWLS, BATMAN VOL. 1: I AM GOTHAM, WONDER WOMAN VOL. 1: BLOOD, THE FLASH VOL. 1: MOVE FORWARD, AQUAMAN VOL. 1: THE TRENCH, CYBORG VOL. 1: THE IMITATION OF LIFE. You can’t go wrong with all these awesome titles to choose from. DC Collectibles has all the Justice League action figures and statues you need to continue or start your collection. 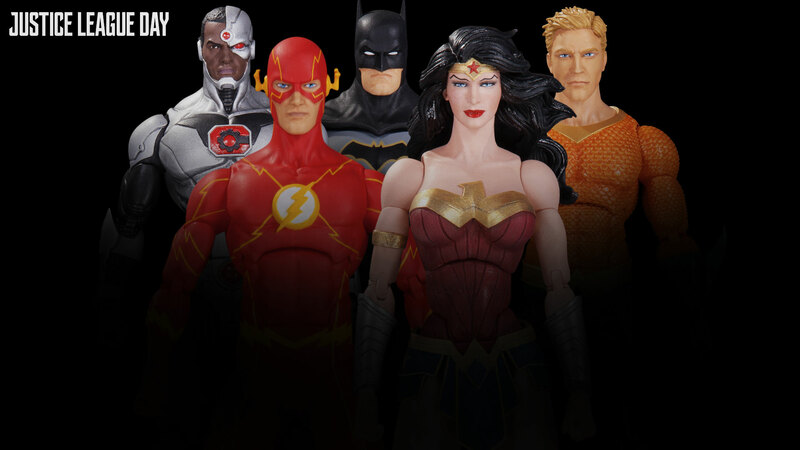 The DC Icons Justice League of America action figure 7-pack includes each member and then there is DC Icons: Wonder woman from Justice League: The Amazo Virus action figure. We can't forget that the members of the Justice League have their very own movie statues. Show us your best display and then tag us on social media @DCCollectibles! See the entire DC Collectibles catalog here. For more information please visit the Justice League Day DC webpage!